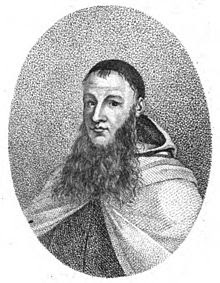 Paulinus, a "tall man with a slight stoop, who had black hair, a thin face and a narrow, aquiline nose, his presence being venerable and awe-inspiring". If his picture is anything to go by, he also had a great beard! He was a missionary to the Anglo-Saxons and worked with Augustine of Canterbury, Justus and Mellitus, evangelist to Kent for 24 years. He was also the first Bishop of York. He accompanied Æthelburg of Kent on her journey to Northumbria to marry King Edwin and eventually succeeded in converting Edwin to Christianity. Paulinus is known for building churches and one of the women Paulinus baptised was Hilda of Whitby.